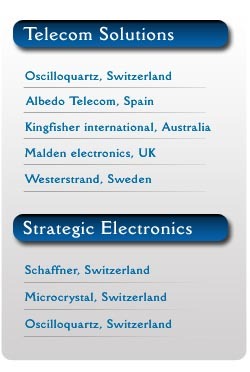 Vibcom offers a wide variety of services. Vibcom believes that in order to achieve total customer satisfaction services available before, during and after commissioning of the equipment are important. These services will ensure successful project implementation and long-lasting operation. Services may start right at the very preliminary stages depending on the size of the project. Factory Acceptance Testing takes place initially to ensure that the equipment meets the customer's objectives. Site services are also offered as part of a turn-key package, including installation, commissioning and training. If you are migrating your WAN data connection to Carrier Ethernet, if you are switching to a new L2 bridged VPN, or if you plan replace your POTS/ISDN telephony by a VoIP service, or if you simply need the opinion of an expert, there are several serivces that Vibcom with the support from ALBEDO Telecom can offer. Performance monitoring in packet switched networks has become central issue to guarantee a transparent and fault free service provision. We can offer ALBEDO SL.Audit, and ViP.Audit for auditing and pre-qualification of IP services that can be adapted to suit every customer requirement. The auditing services are also suitable for permanent monitoring. If you choose this service mode you will get periodic reports and e-mail alerts that will keep you informed about SLA violations and transient service degradations. Both enterprises and service providers may avail of the benefit from our auditing and monitoring services. Enterprises may use SL.Audit, and ViP.Audit to choose the best operator and service or check compliance of SLA while telecom operators may use them as a value-added option to their offers to businesses. The introduction of more stringent industry standards has led to the need for greater control of synchronisation to ensure network reliability and stability. Some forms of testing are aimed at determining the quality of transmission without adequately addressing the cause of errors due to clock instabilities. Telecommunications equipment manufacturers are now required to measure the performance of SDH equipment using parameters that were not specified by previous standards. MTIE and TDEV are now recognised by ETSI and ITU-T as the synchronisation quality parameters. Essential tool for any telecommunications network The Oscilloquartz SyncTester provides an invaluable health check on the efficiency of connections to other networks, locates weak spots and potential problems that may affect the flow of traffic. Together with WinSTS, the SyncTester enables network managers to carry out network stability tests (long and short term), to assess the quality of references from other carriers and to characterise the performance of network element clocks. SyncTester has the unique ability to measure output wander, due to pointer patterns, over long periods of time (e.g. days or weeks), relating to very low clock offsets between SDH multiplexers. The unit can be used in a number of different ways, either as a portable unit or at a fixed point. In figure 1, a 2.048MHz reference generated by SyncTester’s internal reference is applied to the G.812 clock. 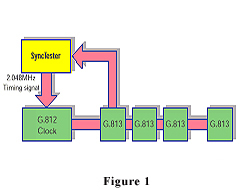 The outputs from the G.813 clocks are then measured against SyncTester’s reference to determine the transfer characteristics at each stage of the SDH synchronisation reference chain. 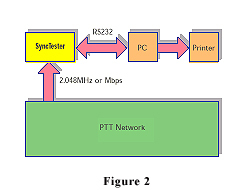 Figure 2 shows the SyncTester used in a PDH environment to assess the long term stability of the network. 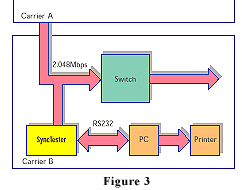 The application in figure 3 is of interest to telecom operators who derive synchronisation references from other carriers, thus ensuring that these references are suitable for their needs. Vibcom offers telecom test equipment like SSU, GPS Receiver, Sync tester, 2Mb testers, IP Probe…… on rental basis. Service centre: well-equipped with internationally trained engineers to support Indian customer¹s requirement of installation and service back-up. We operate with the use of sophisticated test instruments for fault analysis and repairs. Our Service Centre is approved by TEC and we also have a valid infrastructure certificate recommending our credibility and technical support. We are quick to respond to any customer queries/complaints to their satisfaction. Vibcom commits to efficient support in order to assist customers to derive maximum benefit from the operation of the equipment supplied. The support covers quick and reliable assistance with systems operations, remedial services for hardware components, the elimination of reproducible errors that deviate from specifications in the latest unmodified releases of software, maintenance and other services. Vibcom support services provided comprise the modules described hereafter. Under our standard business practice, customers are offered around the clock on-line access to important product and company information, such as product documentation, release notes, and application notes. Under this scheme, customers can also address technical and product related questions to Vibcom via e-mail (info@vibcom.net). Questions will be answered on a best effort basis, typically within one to three working days. This service provides interactive assistance via e-mail, telephone, or fax for remote diagnostic of a trouble situation required by customers in the normal course of operation and maintenance of the equipment. Vibcom will provide standard forms for reporting such incidents. This level of service support coverage ensures the rapid and predictable deployment of on-site intervention for incidents which cannot be resolved by remote diagnostics support (CFR) or for which customer’s own service / technicians are not positioned to undertake required remedial action. “Critical”: An error that creates a condition, which makes impossible to operate the system. “Major”: An error that creates a condition, which makes difficult the performance of one or more critical functions of the system, but which can be circumvented or avoided on a temporary basis. “Minor”: An error that does not impair the performance or continued performance of one or more critical functions of the system.